Cupcakes 'n Daisies: How about some red, day two . . . .
Love those sweet little churn dashes!!! 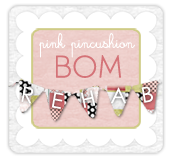 Love those little churn dashes! How beautiful...you had such a productive day! Your basket full of blocks looks so pretty! I should be getting my package from bloggers choice tomorrow and boy,I have been tracking and it is making lots of stops. I am excited to get and this will start another new project (hopefully not another UFO) Love your little blocks and you must have been a busy little bee yesterday. Makes me feel slooooow! Only did last row on a quilt and start side borders. Love the little churn dashes.. what size are the blocks? These are so tiny. Can't wait to see what you make with them. Waiting to see all your projects from your bundle. Maybe it will come today. How cute! 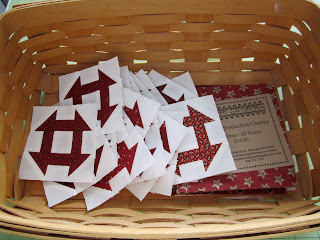 I just finished a mini churn dash in repro fabrics, not all red, but cute still the same. Since it's so small, I thought I'd hand quilt it. I tried several times yesterday but could not get a pic to come up of your bundle. Will try again today. I know it's beautiful!! 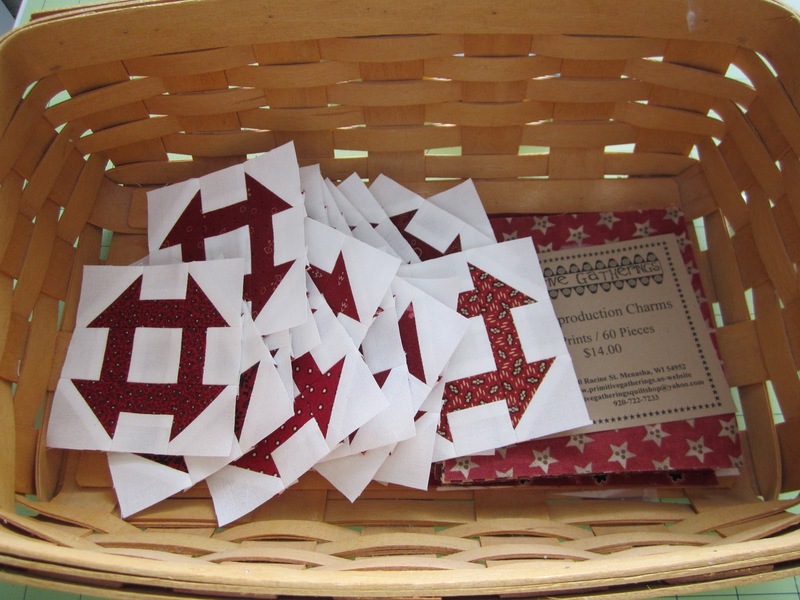 I just love these little blocks - perfect...tiny and red! those little churn dashes have stolen my heart!!! I'm loving those churn dash blocks. And in red! The perfect combination. 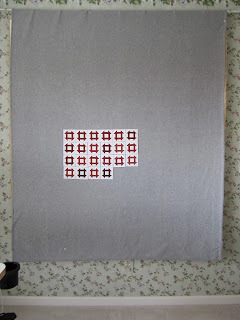 For these new blocks - thinking of a wall hanging, quilt or using them in some kind of accent/border on another project? BTW... I sent a quick email to Kimberly at FQS to let her know your picture doesn't come up when you browse on the Bloggers Choice bundle. I'm sure they will straighten that out soon! GO TEAM RED! Those little red and whites are wonderful. And as for filling that design wall, just like any yummy snack ... one bite at a time. I look forward to seeing this project grow. I adore these blocks. They look so great from far away on your design wall as well as close up. Inspiring! Churn Dash and Ohio Star are my favorite blocks. These are so cute and so small! You've done good progress today. Are you doing a full size quilt or are you going mini on us ? I love your Churn Dashes. 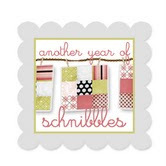 Love the Thelma Childers' Blogger's Choice Fat Quarter Bundle! Love your churn dashes, too.